Unfortunately, as is often the case, the inventories are not complete and most of the new parts are missing, in particular the minifig parts. They will most likely be added in a few months. Our inventory list has a new column showing the percentage completeness of each one (when viewed on a full-width display). We'll be filling in the blanks later this week as we add piece counts to the database. 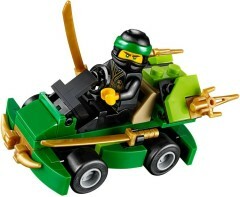 A couple of new polybags have been revealed among the new instructions: 30532 Ninjago Turbo and 30325 My First Dinosaur but unfortunately, because the latter is Duplo, the instruction sheet doesn't actually contain a picture of the set! Ooh! Where can I buy the Ninja Turbo? It looks awesome. What!?!? That is so cool!! Was kinda hoping the MACK Anthem truck was included in those 408 new manuals... guess I’ll have to wait a little longer. Edit: Just realized there is a glitch on the Anthems page. The instructions tab says 0 but the instructions ARE there.